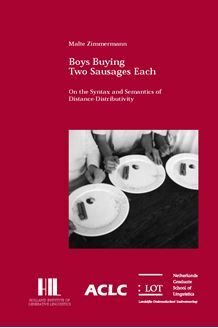 Boys Buying Two Sausages Each – On the Syntax and Semantics of Distance-Distributivity investigates a number of issues at the syntax-semantics interface, among them strict compositionality, structural ambiguity, and the emergence of adverbial readings with adnominal elements. The discussion focusses on the syntactic and semantic behaviour of distance­distributive elements such as binominal each in The boys bought two books each, and in particular on its German counterpart jeweils. At first sight, such items appear to pose a problem for strict (surface) compositionality. Throughout, it is argued that an integrated syntactic and semantic account of distance­distributive items is superior to a purely syntactic account. The analysis is therefore split in two parts. The syntactic analysis shows that distance-distributive elements are regular quantifiers in a special (DP-internal) syntactic configu­ration. Observable cross-linguistic differences in the syntactic distribution of distance-distributive elements are reduced to general syntactic differences between languages, and to differences in the morphosyntactic feature make-up of a distance-distributive item in a given language. The semantic analysis shows how distance-distributive items can be interpreted compositionally in their surface position. The two main results of the analysis are, first, that strict compositionality does not have to be given up for distance-distributive items, and, second, that adnominal elements systematically give rise to adverbial readings if certain well-defined structural and morphosyntactic licensing conditions are fulfilled. This study is of relevance to anyone interested in questions pertaining to the syntax-semantics interface.